Check our directory to make sure we don't already have a listing for the booth. 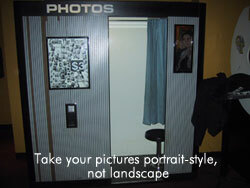 Make sure the booth is an old-style, "dip and dunk," photochemical booth, rather than a digital or Polaroid photobooth. 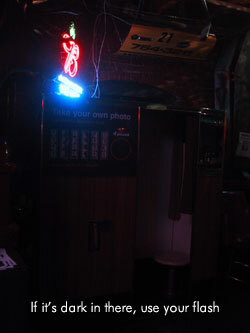 Include a photograph of the booth and a scanned sample photostrip (more on those later). Find out the model number of the booth, if you can, usually located on a small metal plate above the curtain rod on the door frame. Make a note of the location's name and address, the price of a set of photos, and the date you made your visit. 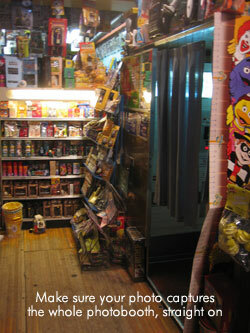 First, make sure you capture the whole booth in your photo, preferably taken straight-on, rather than at an angle (though we know that can be tough sometimes; just do your best). 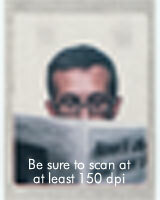 Some things to avoid when scanning photostrips for our directory. First, make sure you send us a scan; digital photos of photostrips can be ok, but not great, and they can also be kind of awful. When you're scanning, make sure you scan the strip at at least 150 dpi; we want to be able to see that tell-tale texture in the photo paper. Scan the entire photostrip, and the background around the strip. We want to see the photo, but we also want to see the border of the photo and the edge of the photo paper. That strange little tear at the bottom of the strip and that bit of the previous photo left on the your strip are the wonderful idiosyncracies that make each photobooth a little different. We'll crop the photo so you don't have to. Note: photostrips not to scale. At this point, we are not including in our directory photobooth locations without a photo of the booth and a sample photostrip from the booth. If you don't have any photographs, feel free to send us the information you have, and we'll put it on our giant "to-do" list for the future. Note: we reserve the right to alter/edit/refuse the information you send. We make a concerted effort to keep the site as cohesive, consistent, and on-message as possible. Please be patient -- we have day jobs, and will get to your submission as soon as possible. 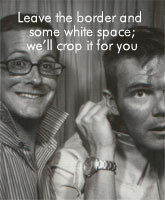 Once again, thanks for helping make Photobooth.net the most complete resource for photobooths on the web.